Thanks Geraldine for this photo. 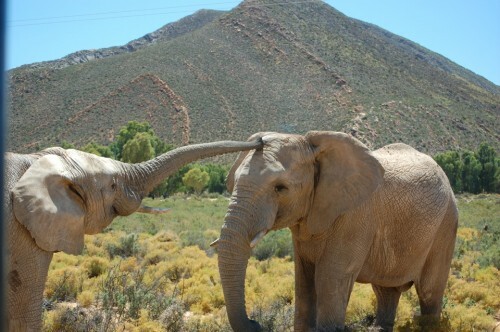 I’ll do my best to keep the commentary brief for today’s post … let’s be honest, you’re just here for the elephant pictures. 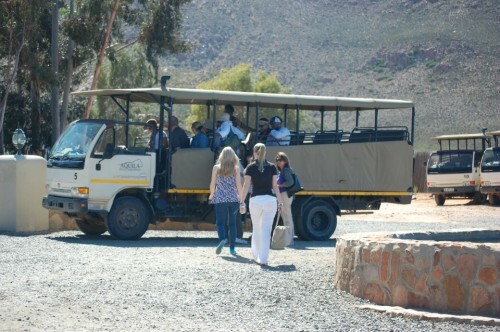 The very glamorous safari bus. 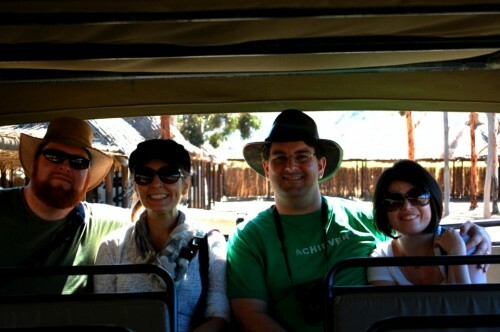 From left to right: Joel, Geraldine, Phil, and Meredith. 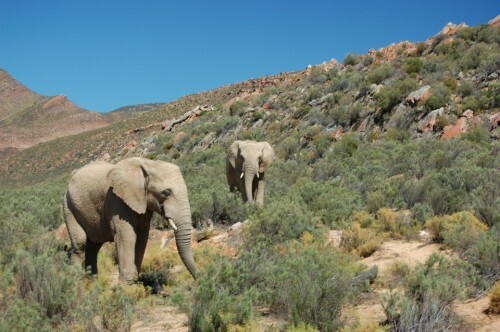 Our first big five sighting – elephants! These two are brothers, and they were play-fighting. Every time I look at this picture, I think “Simba,” and giggle to myself. Because I’m probably the first person ever to make a Lion King reference whilst in Africa. 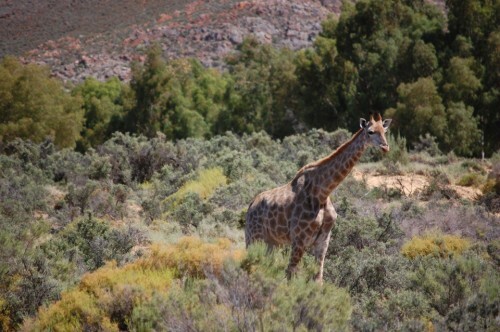 If this giraffe looks a little hunched, that’s because the elephants have overeaten the stuff on the trees, and so she’s learned to bend her neck forward and eat like a horse. Our guide said this is an ongoing problem – I’m not sure if he meant on the Aquila reserve, or in general. 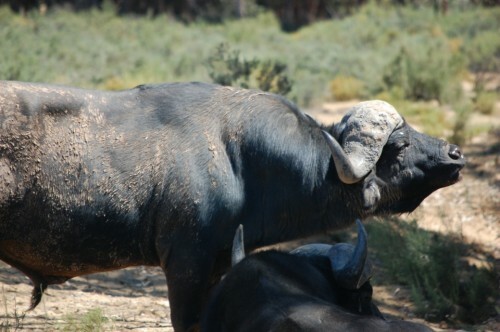 These, the African buffalo, are actually the most dangerous of all of the big five because they give no warning before they attack. Our guide drove up to them, then turned the bus around, just in case we needed to make a quick getaway. I was a little panicked, but those buffalo were not interested in doing anything other than lying down in the shade. It was hot out there. Rhinos. All of the rhinos at the Aquila Safari are females – they had one male who was killed about a year ago by poachers. Very sad. 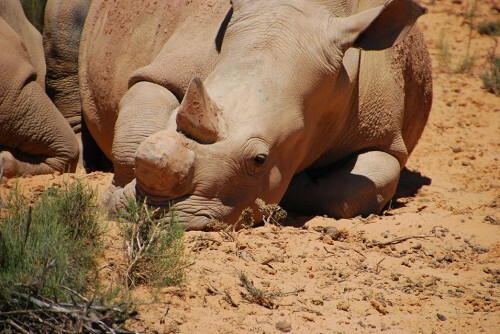 Male rhino horns are worth $9,000 per kilogram – you can read more here. 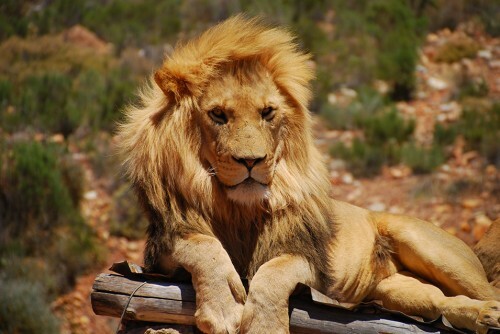 Then we arrived at the Lion’s Den. The lions are kept in a separate, caged area complete with a Jurassic Park gate (when we pulled up to it, the guide got off the bus to open the gate and said to us “welcome to Jurassic Park. It was funny, because Joel and Phil were already singing the theme song.) I laughed, until I realized that the cage probably wasn’t to keep the lions in, but humans (and zebras) out. 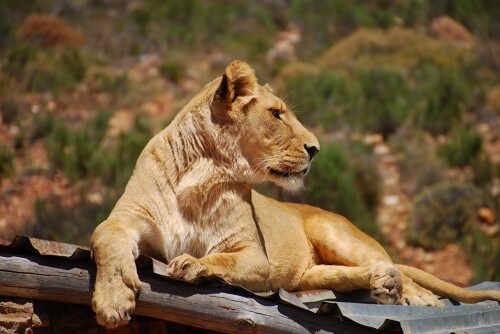 They had six female lions, all napping in the sun. 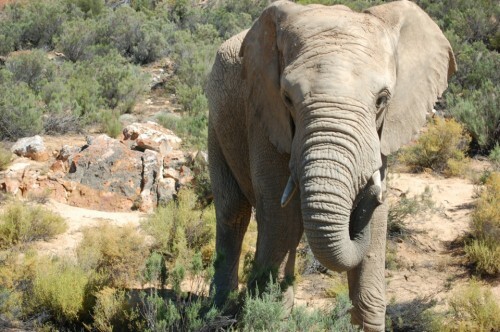 After the drive around the reserve, we got to see the rescued animals. 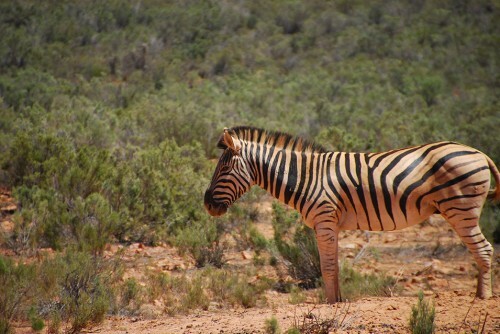 They have all been rescued from canned hunting, and don’t have the skills to roam the reserve with the other animals. They had two more lions, a leopard, and cheetahs. 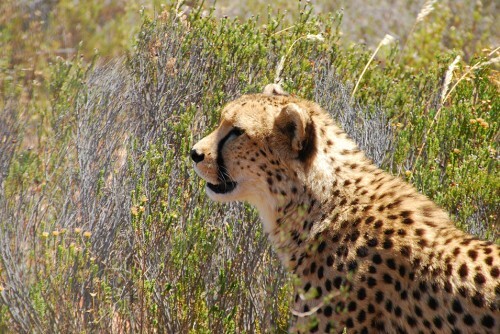 We got very up close and personal with the cheetahs – close enough to hear them purr! Notice that we didn’t see a leopard in the wild part of the reserve – there was one on the property, but leopards are notoriously the most difficult to spot. 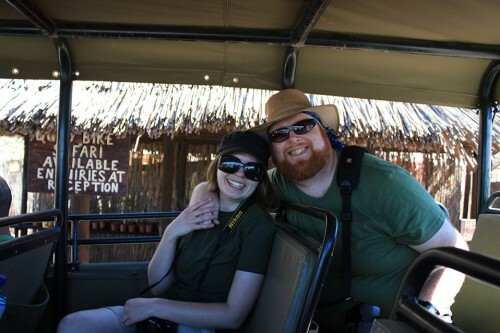 I’ll leave you today with a funny safari story: our drive lasted about three hours, and two hours in, we stopped for a sparkling wine break (what?! That’s totally normal in South Africa.) Some of us ladies were a little desperate for a bathroom, so Geraldine approached our guide and asked if it would be all right to relieve ourselves in the bushes.